These are not words normally associated with robotic pool cleaners. However, the Maytronics Wave Series are any-thing but normal. Born of 30 years of technological research and innovation, the Wave Series was specifically de-signed to meet the unique demands of the largest and most complex commercial pool applications and offers aquatics managers the flexibility, reliability, and performance they need to manage large aquatics facilities. For all pool types, sizes and shapes. Dolphin’s programmable Institutional line of robotic cleaners feature heavy-duty cleaning performance, with robust reliability for long term, cost effective operation. Dolphin is the proven, professional solution for any budget and any pool from a small 20 X 40 wading pools to the largest 50 meter competitive aquatic facility. Manually vacuuming a pool for 2 hours a day adds up to over $7,000 a year in labor costs. Payback can be less than 12 months. 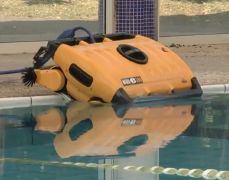 Automatic pool cleaners can operate at night providing a clean pool before the first swim. A Wave Cleaner delivers a sparkling clean pool with less downtime, less hassle, and a cleaner pool for patrons. 36-month Warranty and local service. Every Wave cleaner comes with a 36 month bumper-to-bumper warranty and local certified technicians do any needed repairs. No need to ship it back to the factory. Every Wave dealer has parts on hand and can return the cleaner to op-eration in a short time. There simply are not more advanced or better perform-ing robotic cleaners on the market today. 1000’s of aquatics professionals trust the Wave Series for its performance, convenience, and reliability. Wave cleaners are engineered to provide solutions for every size pool and every budget.